Kesoram Industries registered a 10.92 per cent decline in its net profit to 41.37 crore in the financial year ended March 31, 2002 as against Rs 46.44 crore in the previous year. The empowered committee of state finance ministers at a recent meeting in New Delhi has unanimously recommended to the Centre to come to the rescue of the states enabling them to overcome their financial crisis. The government today gave an assurance that before bringing any kind of labour reforms in the country all the concerned parties including the trade union would be duly consulted. The government today said that the Petroleum Regulatory Bill will be introduced in Parliament during the current session. Petroleum Minister Ram Naik stating this in the Rajya Sabha during the Question Hour also added that till the Bill was passed the Ministry would act as the regulator. The latest credit policy of the Reserve Bank of India attempts to protect the interests of the compulsive saver while encouraging banks to move towards lending cheaper loans. Steel re-rolling mills in Mandi Gobindgarh are facing crisis because of the rise in the prices of raw material. The rise of Rs 1000 per metric tonne in the ingot price has added to the problems of the steel mills. Suzuki Motor Corporation of Japan and the government have reached an official level agreement on disinvestment of equity in the joint venture Maruti Udyog by the Indian partner. Hindustan Motors today started accepting bookings for the luxury sports utility vehicle Mitsubishi Pajero. The company’s turnover was marginally higher at Rs 1356.46 crore as compared to Rs 1345.43 crore in the previous year. Gross profit during the year under review stood at Rs 84.18 crore as against Rs 91.75 crore in the previous year. Company sources said the previous year’s figures are not comparable with the current year’s figures as work at company’s refractory section has been suspended since March 5, 2002. Work at the company’s rayon factory has been suspended since August 2, 2001. Moser Baer India has posted a net profit of Rs 61.64 crore for the fourth quarter ended March 31, 2002, up 59.88 per cent from Rs 38.55 crore the company recorded in corresponding period of last fiscal. The company has posted a 59.71 per cent rise in net profit to Rs 221.30 crore for FY-02 as compared to Rs 138.56 crore for FY-01. The total income soared from Rs 351.91 crore in FY-01 to Rs 683.02 crore in FY-02. Shalimar Paints has posted a net profit of Rs 34 lakh for the quarter ended March 31, 2002, as against Rs 8 lakh in the corresponding period of the previous year. Infrastructural project finance company Srei International Finance Ltd, having an asset base of Rs 1,200 crore, has acquired a strategic stake of 8.70 per cent in Feedback Ventures Pvt Ltd through Srei Capital Markets Ltd, its wholly owned subsidiary. Gillette India reported a net loss of Rs 2.59 crore for the first quarter ended March 31, 2002 as against a profit of Rs 3.80 crore during the same quarter last year. Jayshree Tea and Industries Ltd has recorded a decline in its net loss to Rs 8.47 crore in the quarter ended March 31, 2002 as compared to a loss of Rs 10.96 crore in the corresponding period last year. MRF Ltd has posted a net profit of Rs 13.34 crore for the second quarter ended March 31, 2002, a rise of 211.68 per cent from Rs 4.28 crore for corresponding period last fiscal. The total income (net of excise) rose from Rs 430.34 crore in MQ 2001 to Rs 444.9 crore in MQ 2002. United Phosphorus has reported a 80.43 per cent rise in net profit at Rs 36.07 crore in financial year ended March 31, 2002, compared to Rs 19.99 crore in the previous fiscal. The board of directors has recommended a 10 per cent dividend. Adlabs Films has posted a 16.89 per cent lower net profit at Rs 10.25 crore for the year ended March 31 as compared to Rs 12.34 crore in the previous year. Kodak India has reported a 27.54 per cent rise in net profit at Rs 3.89 crore for the first quarter ended March 31, 2002, compared to Rs 3.05 crore in the corresponding period of previous fiscal. The empowered committee of state finance ministers at a recent meeting in New Delhi has unanimously recommended to the Centre to come to the rescue of the states enabling them to overcome their financial crisis. That has brought some ray of hope. The committee identified the following factors that have led to the precarious financial situation in all states: 1. Pay revision subsequent to the recommendations of the Fifth Pay Commission. 2. Mounting Centre’s and other debt burden on states. 3. Shortfall in devolution of central taxes to the states. In this context, the committee has submitted the following proposals to the Centre on compensating the states: 1. The Centre should provide at least 50 per cent of the total additional burden because of revision of pay scales by the centre. 2. The Centre should allow states to borrow from open market to restructure debt to reduce debt burden. 3. The Centre should consolidate state’s debt to reduce debt servicing rate, which should not be more than the rate which the Centre is called upon to pay. 4. Plan assistance should be provided to the states so that at least 50 per cent, thereof, is grant-in-aid as against the present rate of 30 per cent. 5. States should freeze their budget for salaries and wages at the present level besides right sizing the respective governments. These important unanimous decisions were taken by the committee while re-fixing the cut-off date for introducing VAT, Value Added Tax, effective April 1, 2003. It is a multiple stage tax taxation applicable at each stage. The present flaw in the realisation of sales tax is that the law itself provides loopholes. There is no sales tax if deal is between registered dealers or on consignments transferred to branches. Taking advantage of this often “fictitious” firms are created and book entries shown, thereby, cheating the government. The VAT would, however, ensure that the benefits accrued to the consumers as well. In Punjab, fiscal reforms are already on the anvil so is application of VAT. The Council of Ministers has already taken several steps to effect economy and mobilise resources. More measures are in the pipeline. The bottom-line is that all fiscal reforms would be such as to have wide “social acceptability and equality, political validity and economic viability”, thereby, encompassing political commitments made by the Congress during February Assembly elections. Interestingly, as per the blue-print for introducing VAT, it was decided by the committee to do away with all sales tax concessions, incentives and deferments. Second, as per the earlier decision when introduction of VAT was postponed it was decided that industries in the pipe-line, as on May 1, 2000, if commissioned or were to come into production within two years, by May 1, 2002, would, however, get these exemptions. The dead-line for concessions will end tomorrow, though, VAT would be introduced from April 1, next. At the moment, Punjab has 6,000 industrial units that should have been completed within the past two years but have not been. Hence these are now out of the purview of the slew of concessions, incentives and deferment in collection of taxes etc. that would have accrued to them. Incidentally, this number, 6,000 units is more than the number of all the units put together in all the states and union territories. This assurance was given by the Labour Minister, Mr Sharad Yadav in the Rajya Sabha while winding up the discussion on the working of the Labour Ministry. The minister said, “we will take into confidence all those concerned, including trade unions, before bringing in amendments in the Industrial Disputes Act and the Contract Labour Act to push forward labour reforms”. Some concerns had been expressed and some controversies raised on labour reforms and all would be consulted to address them, he said. Mr Yadav, however, skirted the issue of raising the ceiling on bonus. He was non-committal when Congress member Ramchandra Khuntia and CPI(M) member Jibon Roy repeatedly asked whether any decision had been taken on Prime Minister Atal Behari Vajpayee’s assurance that Bonus Act would be amended to raise the ceiling. Admitting there was need to have a viable and effective social security particularly for unorganised labour, Mr Yadav said the second Labour Commission headed by Ravinder Verma, which was looking into all aspects, was expected to submit its report shortly. The government today said that the Petroleum Regulatory Bill will be introduced in Parliament during the current session. Petroleum Minister Ram Naik stating this in the Rajya Sabha during the Question Hour also added that till the Bill was passed the Ministry would act as the regulator. The government had taken a number of measures to prevent adulteration in motor spirit and diesel, he said while pointing that there was an Anti-Adulteration Directorate in the Ministry and there were mobile laboratories to carry out random check of the quality of fuels. Mr Naik said state governments were also empowered to take action under the Essential Commodities Act if somebody was found dealing in adulterated petrol or diesel. He said the government had laid down guidelines for granting of authorisation to market transportation fuels to the new entrants including the private sector. The government has stipulated an investment of Rs 2000 crore in oil infrastructure for being eligible to market transportation fuels. Companies which propose to invest this amount, would have to furnish a bank guarantee of Rs 500 crore to enter petro retail, Mr Naik said. The minister said the decision of the Centre to allow private oil companies to market transportation fuels would facilitate attracting private capital and competition. Drawing a lesson from the flak Finance Minister Yashwant Sinha drew for tinkering with small savings rates, the RBI Governor, Dr Bimal Jalan, has played safe by leaving the savings rate, the only interest rate on deposits side which is regulated by the RBI, unchanged and pumping in Rs 5000 crore of liquidity into the system by effecting a 50 basis point cut in the credit reserve ratio (CRR). The interest rate on savings account at present is 4 per cent. “Considering the fact that bulk of such savings deposits are held by households, including households in rural and semi-urban areas, on balance, it is not considered as opportune time to deregulate the interest rate on savings account”, the policy statement said. Realising that the corporate sector was not lifting credit, the RBI made lending for the housing sector, agriculture and small businesses more attractive by giving additional flexibility for the banks. For instance it cut the risk weight on housing loans from 100 per cent to 50 per cent and recognised them as priority loans, a move that would encourage banks to go in aggressively for housing loans because the impact of these loans would be less on their capital adequacy ratio. The RBI removed the limit on minimum lending rate which would allow cooperatives to introduce cheaper home loans. The Punjab National Bank was quick to react to the credit policy and on the very same evening of the announcement reduced interest rates on housing loans by .5 per cent. Another measure that would impact the normal customer of bank is RBI’s advise to the banks to move towards floating deposit rates. While the measure would protect banks from interest rate fluctuations, the customer could gain or lose according to market realities. Bankers said several banks are likely to push for floating deposit rates and they would offer higher rates to depositors who opt for the scheme. The new policy also brings relief to millions of bank customers as the RBI has directed banks to disclose all the costs of a loan. Previously banks used to camouflage hefty costs in fine print and take the customer by surprise. Banks have now been asked to switch over to the “all cost” concept by clearly declaring the processing charges and services charges. Such bank charges have to be publicly announced and hopefully hidden costs of a loan would be a thing of the past. The RBI has addressed the problem of banks charging higher interest rates for small borrowers. Unlike big borrowers, who take loans in lakhs and crore and are able to negotiate cheaper interest rates, the small customer is often short shrifted. The RBI has said it is not reasonable to keep very high interest spreads and banks should ensure that credit may be available to the borrowers at reasonable interest rates. The RBI would be putting a consolidated picture of the various interest rates charged by banks in its website. Steel re-rolling mills in Mandi Gobindgarh are facing crisis because of the rise in the prices of raw material. The rise of Rs 1000 per metric tonne in the ingot price has added to the problems of the steel mills. Against this rise, the conversion charges have not increased, says Mr Surinder Singhi, Member, National Executive of the All-India Steel Rerolling Mills Association. Mr Singhi disclosed that the steel mills were facing closure because of the financial crunch and no demand from the government for building material. There are 300 steel-rerolling mills in Mandi Gobindgarh and out of these only 50 per cent are working. He warned that the steel industry could not absorb in any hike in power tariff as the same would be suicidal. The rise in steel prices is of Rs 1,000 per metric tonne. At the same time, the prices of raw material, including ingot have also witnessed an increase of Rs 1,000 per metric tonne. Enquiries show that the prices of steel, including MS rounds and CR sheets, have started witnessing upward trend for the past three weeks because the main producers of steel like SAIL and Tata have raised the prices by Rs 600 to Rs 1200 per tonne. These units have effected the enhancement to meet the losses. With the result the prices in the local market also started going up although there is no increase in the demand of finished steel. Enquiries further reveal that even the export of steel has been affected. Export of hot-rolled cold steel to the USA has been hit because of anti-dumping duty imposed by the USA. The export from China and other European nations has also been affected. The 3200cc inter-cooled-turbocharged diesel engine-fitted model called Pajero GLX will be sold at about Rs 34 lakh (ex-showroom in Delhi), an HM official told PTI. Intel Asia Electronics announced today the opening of three new Intel Architecture solution labs by leading India-based e-business companies — PricewaterhouseCoopers in Kolkata, Satyam Computer Services and Wipro Infotech in Bangalore. The USA has imposed anti-dumping duties on import of silicomanganese from India and two other countries setting a margin of 15.32 to 20.42 per cent for the Indian products. 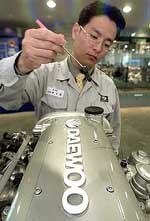 General Motors Corp. (GM) today signed a deal to take over South Korea’s bankrupt Daewoo Motor Co. The contract was signed in front of media by GM chairman John F. Smith and Jung Keun-Yong, Governor of Daewoo’s key creditor Korea Development Bank.